Personal: Single…Nickname, “The Shark”…Hobbies, working out and golf…Bowled for McKendree (Ill.) University where he majored in sports management. 2018: Finished second in Xtra Frame Wilmington Open losing to Cristian Azcona of Puerto Rico 217-214 in title match...Finished sixth in Storm Striking Against Breast Cancer Doubles...Was member of Silver Lake Atom Splitters team that won PBA League Elias Cup. Career: In 2017 finished second in Xtra Frame Reality Check Classic losing to Josh Blanchard 232-204 in championship match. Finished fourth in Xtra Frame Lubbock Sports Open losing to Marshall Kent 259-228 in opening stepladder match. Finished seventh in U.S. 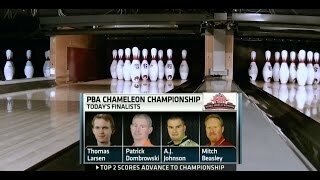 Open...In 2016 matched his career best Tour finish of second in PBA Chameleon Championship losing to Mitch Beasley 246-237 in title match...In 2015 finished third in Xtra Frame Iowa Midwest Open losing to Pete Weber in semifinal match 213-187...Gained national attention as top qualifier for the 2015 USBC Masters but lost to two-time reigning Player of the Year Jason Belmonte in title match 202-157 to finish second…Finished 17th bowling in his first U.S. Open in 2013…Owns five PBA regional titles. Won 2017 World Bowling Championships team gold medal and bronze in all events...2017 and 2018 PBA Midwest Region Player of the Year...Five-time and current member of Team USA...2012 and 2013 Member of Junior Team USA...Bowling for McKendree University 2013-14 Collegiate Most Valuable Player…2013-2014 First Team Collegiate All-America…2013 Junior Gold Championships champion.